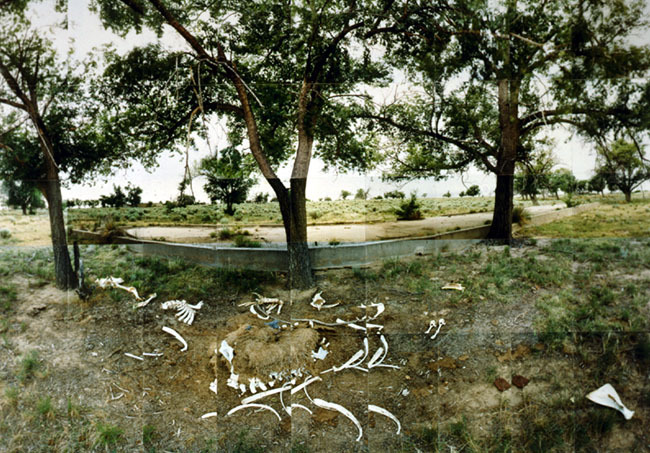 Gila River Relocation Camp, Dog Grave, 1997, panoramic photo collage. 38"x 31"
Gila River Relocation Camp, Foundations, 1990, panoramic photo collage. 22"x 56"
Gila River Relocation Camp, Monument, 1995, panoramic photo collage. 31"x75"
Granada Relocation Camp, Foundation, 1997, panoramic photo collage, 23"x 31". 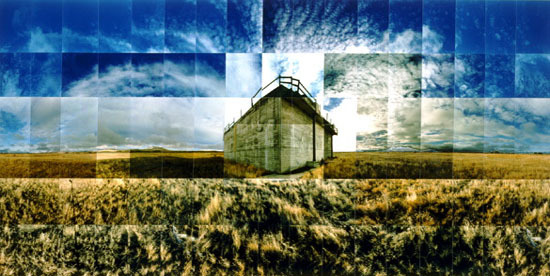 Heart Mountain Relocation Camp, Blue Room, 1995, panoramic photo collage, 23"x 45". Heart Mountain Relocation Camp, Hospital, 1995, panoramic photo collage, 32"x70". 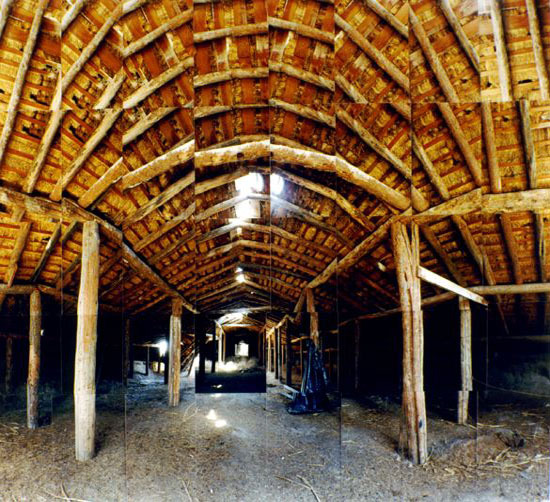 Heart Mountain, Root Cellar, 1996, panoramic photo collage, 20"x 70". Jerome Relocation Camp, Farm, 1995, panoramic photo collage, 22"x 59". Jerome Relocation Camp, Sewer, 1995, panoramic photo collage, 23"x 56". 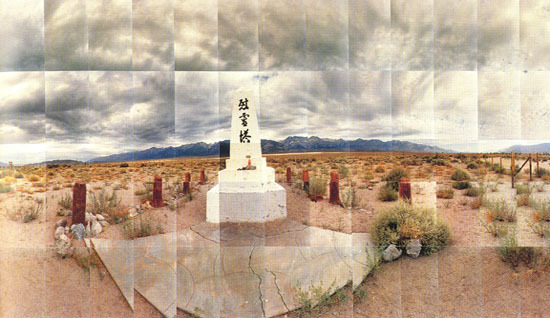 Manzanar Relocation Camp, Guard Gate,1993, panoramic photo collage, 27"x 65"
Manzanar Relocation Camp, Monument, 1995, panoramic photo collage, 48"x 80". Minidoka Relocation Camp, Root Cellar, 1992, panoramic photo collage, 31"x72"
Minidoka Relocation Camp, Waiting Room, 1992, panoramic photo collage, 27"x 70". 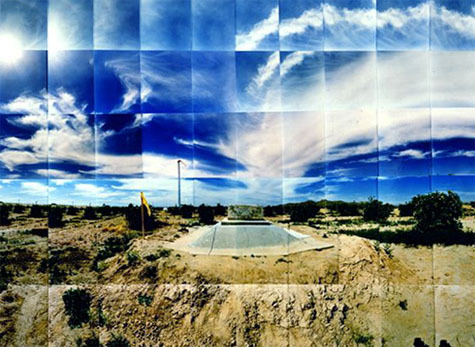 Poston III Relocation Camp, Sewer, 1997, panoramic photo collage, 26"x 63". Rohwer Relocation Camp, Cemetary , 1995, panoramic photo collage, 33"x 65". 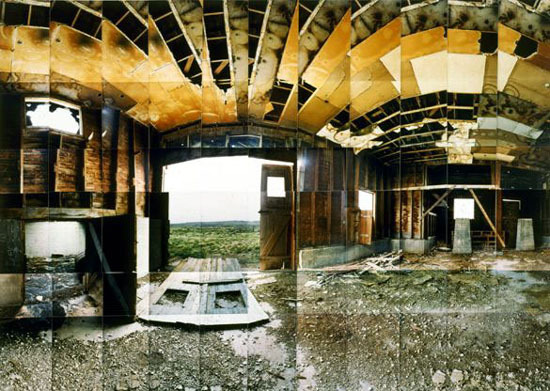 Topaz Relocation Camp, Foundations, 1995, panoramic photo collage, 31"x72". Tule Lake Relocation Camp, Stockade, 1992, panoramic photo collage, 27"x 79"". Tule Lake Relocation Camp, Sewer, 1995, panoramic photo collage, 32"x 59". Bay Farms Internment Camp, British Columbia, 1996, panoramic photo collage, 26"x 64". Lemon Creek Internment Camp, British Columbia, 1996, panoramic photo collage, 27"x 65".